rec. KongressHalle Saarbrücken, 18-20 June 2012. The two works on this disc were left incomplete. The dates I have given above simply reflect those on which Enescu wrote as much of the score as he did. Each was completed in the 1990s by Pascal Bentoiu (b. 1927). Isis was the pet-name Enescu gave to his mistress Maruca Cantacuzini whom he married in 1939. It is also the name given to the Egyptian goddess of love, magic and the dead. Bantock took the Lament of Isis as the subject of one of his songs. 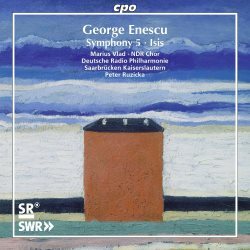 Enescu's Isis is refulgent, melodic and rhapsodic yet its lyrical weave remains lucid. This is achieved no matter how luxurious the ideas which breathe and surge through its pages. Broadly speaking you can think of it as a companion to Szymanowski's Third Symphony, Scriabin's Poem of Ecstasy, Miaskovsky's Fourth and Thirteenth Symphonies and to Enescu's own Vox Maris. The writing is tonal, mystical and impressionistic not least in its intimate and naturally integrated threading of vocalising female voices with the orchestral elements. The Scriabin parallel is well worth examining against the fervid passages around 13:10-15:20. With this work now in the recorded canon Messiaen and Silvestrov can be heard as successors to Enescu. The big four movement Fifth - and last - Symphony is also lush but the mystical rites of Isis are absent. The first movement is reminiscent somewhat of the much later Korngold Symphony and is a less opaque counterpart to Joseph Marx's gorgeous orchestral works of the 1920s. The heaped-high strivings of the first movement do lose their way somewhat in the first movement. Dreamily glowing pastoral idylls are the order of the day in the second movement with some gorgeous moments along the way (3:50 onwards). At less than five minutes the Vivace con fuoco is a needfully fleet-pulsed counterbalance to the other movements. Enescu and Bentoiu return to form with a groaningly serious finale which marries tragedy, deliberation and poetic musing. The attractive-toned tenor Marius Vlad sings caressingly the words of Michail Eminescu's poem I have one last wish. The music more than meets half-way the melancholy and ecstasy of the words. It is as if we are hearing an extension of Whitman in Delius's Sea-Drift. It's very much in that atmosphere and the female chorus intensify the effect. The liner-notes are by Jürgen Ostmann and Peter Ruzicka. They are in German and English. The words sung by the tenor in the finale of the Symphony are printed in sung Rumanian, German and English. Recording quality is very good and the performances feel impeccable. Bentoiu has done sterling work in realising these scores from the fragments and shreds left behind by Enescu. I suspect that there is quite a lot of Bentoiu's own invention in this music but no harm in that. The results are resolutely serious, well integrated and not lacking in poetic beauty. The finale of the Fifth Symphony in particular is strongly memorable. Fascinating. I trust that CPO, who have done no other orchestral Enescu, will now be looking at opportunities to record Bentoiu 's completion of the Fourth Symphony.